For a casually elegant ensemble, go for a grey polka dot blazer and Vince stay pressed classic fit pants — these pieces fit nicely together. Up the ante of your ensemble with brown leather oxford shoes. If you're after a casual yet stylish getup, reach for a grey zip sweater and Vince stay pressed classic fit pants. Both garments are totally comfortable and will look great together. Dress up this getup with dark brown leather casual boots. 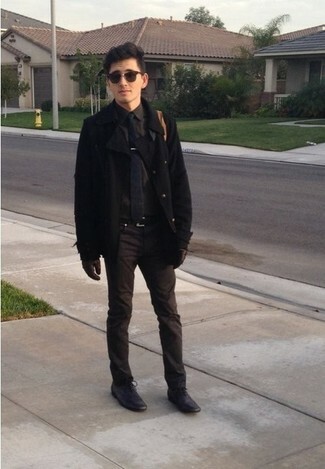 This combination of a black pea coat and Vince stay pressed classic fit pants is very easy to make up without a second thought, helping you look awesome and ready for anything without spending a ton of time combing through your wardrobe. Bring a touch of sophistication to your getup with black leather oxford shoes. 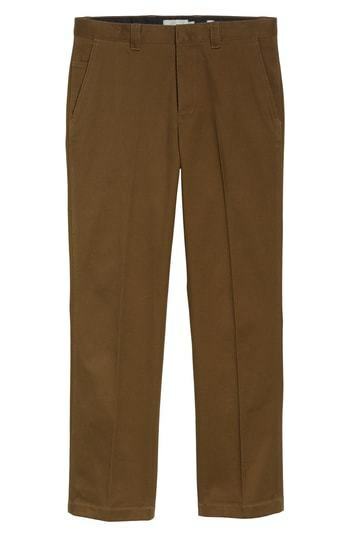 If you're on the hunt for a casual yet dapper outfit, pair a charcoal v-neck sweater with brown chinos. Both pieces are totally comfortable and will look great paired together. To add more class to your getup, finish off with dark brown leather casual boots. 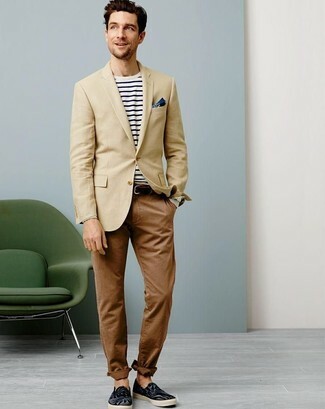 For a smart casual ensemble, consider wearing a tan blazer and brown chinos — these pieces fit nicely together. For something more on the daring side to finish off this getup, opt for a pair of navy canvas espadrilles. If you're on the hunt for a casual yet seriously stylish outfit, try pairing a navy floral long sleeve shirt with Vince stay pressed classic fit pants from Nordstrom. Both pieces are totally comfortable and will look great paired together. Sporting a pair of blue suede derby shoes is an easy way to add extra flair to your getup. For a casually elegant look, consider pairing a navy blazer with Vince stay pressed classic fit pants — these two items play pretty good together. Add a more relaxed twist to your getup with blue plimsolls. 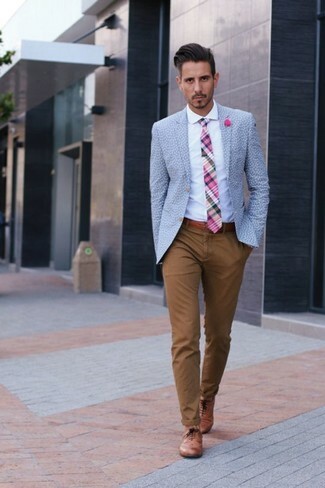 This pairing of a charcoal blazer and brown chinos is very easy to put together without a second thought, helping you look stylish and ready for anything without spending too much time combing through your closet. 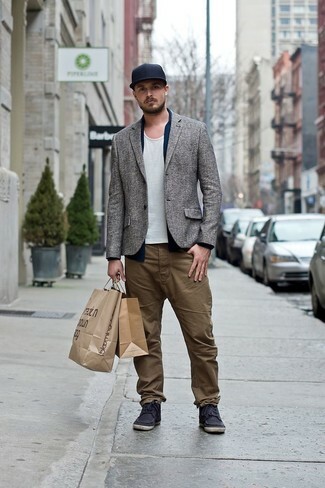 For a casually elegant getup, wear a grey wool blazer with brown chinos — these two pieces fit nicely together. When it comes to shoes, this outfit pairs brilliantly with charcoal canvas casual boots.